Opening in Theaters July 20, 2018 "Mama Mia! : Here We Go Again"
While Sophie has just found out she's pregnant, she focuses on her mother Donna's young life during her pregnancy. Like Donna, Sophie realizes the need to take risks. It's been 10 years since the release of “Mama Mia” in theaters, now comes the sequel which finds Sophie now pregnant and facing her fears. With the help of her 3 fathers and Donna's best friends, Sophie discovers her mother's journey and her strength. “Mama Mia 2: Here We Go Again” is not a perfect film, but it is an exuberant one. It offers up a celebration of life and the joy of family much to the credit of its cast led by Lily James as young Donna and Amanda Seyfried as Sophie, Donna's daughter. Underscored with more music from ABBA, the movie is well paced as it follows both our heroines in 2 different time lines, which ultimately come together in a very touching, joyful and emotional way. 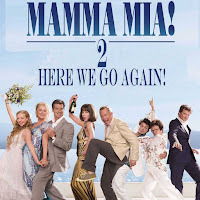 “Mama Mia 2: Here We Go Again” is well worth seeing and singing along to.